Mustafa AY – TDO – 09.08.2018 On Tuesday, right after US Senate renewed the heavy sanctions on Iran, N. Korean FM Ri Yong-ho paid an official visit to Tehran. 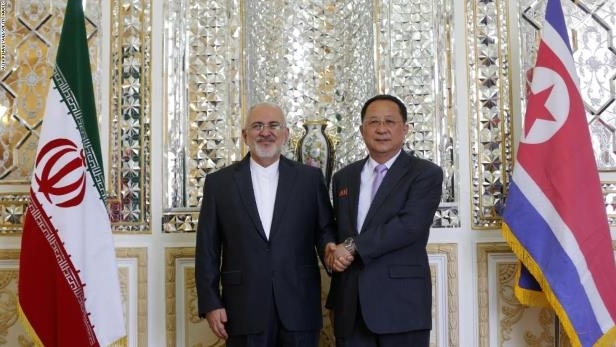 N. Korean FM was met by his Iranian counterpart Javad Zarif. Both top diplomats arranged a joint meeting to discuss the issues varying from ongoing conflict in the region to US re-imposition of heavy sanctions against Iran. Minister Yong-ho stated Pyongyang’s sincere intentions to enhance bilateral relations. N. Korean FM lastly stressed that Washington did make wrong decision by renewing the sanctions on Tehran. US Senate’s re-imposition of sanctions prompted the reaction of its close allies in Europe –UK, Germany and France-. According to official assertion by those 3 nations, USA’s invalid and wrong decision has a tendency to fuel ongoing tensions in particularly Yemen and Syria, where proxy wars between USA and Iran are going on.